Jewish settlers torched a Palestinian car near Shaqba village, west of Ramallah, on Wednesday while others painted racist slogans on a Christian monastery in Jerusalem. Local sources told the PIC reporter that groups of Jewish settlers stormed the village and set ablaze the car of Shaqba village municipality chairman Ramadan Al-Masri. They said that the car was parked near a bridge at the outskirts of the village, noting that Israeli occupation forces provided protection for the settlers. They said that the term “Price Tag” was inscribed near the car. Meanwhile, other groups of settlers painted racist slogans on a Christian monastery in Jerusalem along with the same slogan “Price Tag”. The head of the Board of Directors of the Jerusalem District Electricity company, Yousef Al Dajani, called for an urgent processing of the file of the crisis of the company's accumulated debt for the Israeli occupation. This came after the Israeli water company implemented a court order allowing it to seize the financial accounts of the Orthodox Church in Jerusalem. Al-Dajani described such step as a dangerous precedent and a warning of dire consequences for the Jerusalemite institutions, whether the religious or the civil ones. "This development is extremely important and requires that everyone takes seriously his responsibilities" and participate in solving the debt crisis of the Jerusalem Electricity Company owed for the Israeli company, al-Dajani said in a press statement on Sunday. He pointed out that not paying the electricity bills by some citizens and institutions and the continuation of thefts were the main results of the electricity company's debt crisis, adding that the Israeli authorities are serious in their threats. Al-Dajani also noted in his statement that the developments in the case of the Church of the Resurrection and the Orthodox Church prove that Israeli bodies do not respect the church's sanctities and customs and represent very serious and alarming indicators. A statement released on the Muslim Brotherhood’s official English page on Saturday condemned the “Zionist occupation authorities’ intransigence towards the Church of the Holy Sepulchre in Jerusalem.” The statement was issued by Gamal Abdul-Salam, a Brotherhood leader and director of the Jerusalem Committee Union of the Federation of Arab Doctors. The church in question is one of the most important sites for Christians as it is believed to be situated on Golgotha, the hill where Jesus was crucified, and the sepulchre itself is believed to be his tomb. The Israeli government has demanded the church pay outstanding power and water bills amounting to millions of dollars, a cost which places of worship are normally exempt from. 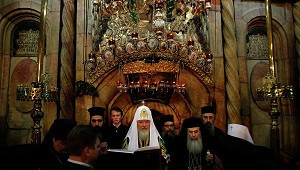 The government has also issued a freeze on the Patriarch’s bank account until the debt is settled. 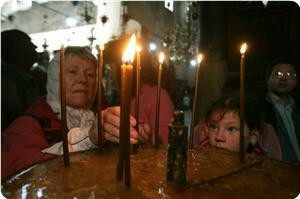 In response to this demand, the leaders of the Greek Orthodox in Jerusalem threatened to close the church to worshippers and tourists unless the government withdraws their demand. Neither the Brotherhood nor their political wing, the Freedom and Justice Party, were available for comment. Abdul-Salam confirmed his statement, but was unavailable for any comment. Mina El-Kess, the political co-ordinator for the Maspero Youth Union, said he was not surprised the Brotherhood chose to be critical of Israel’s treatment of Christians and Muslims. “The Ikhwan is playing a game,” he said. According to El-Kess, another such incident of a contradictory statement is the tweet sent to the American embassy during the anti-Islam film protest, where the Brotherhood expressed their relief none of the embassy staff were hurt and hoped to maintain good relations with the US, while their Arabic webpage praised the protesters and called for another protest. “They are of a radical ideology and will always speak of other people and groups, but never themselves,” he concluded. 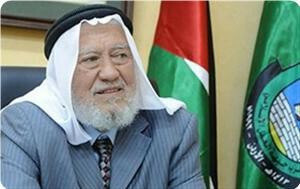 Hamza Mansour, secretary-general of the Islamic Action Front, the political party of the Muslim Brotherhood in Jordan, called for the formation of an influential Islamic-Christian lobby to confront the Israeli lobby, and to serve the nation principal issues, topped by the Palestinian cause. "The needed challenge before Muslim and Christian clergy, and Islamist politicians, is to adopt a joint program to promote tolerance and cooperation's values on two levels: on the internal level, it would reinforce national unity, and on the external level, it would serve the nation principal issues, topped by the Palestinian cause, to form an Islamic-Christian lobby to confront the Israeli lobby, Mansour said in "Islamists and Arab Christians" seminar held by Middle East Studies center in collaboration with the Royal Institute for Religious Studies in Amman yesterday. Mansour added that with the Arab spring atmosphere and with the Islamists rising through the ballot box, questions are being asked about the Christians' security and the rights they gained. Some of questions and fears are justified, especially that there was a break from Islamic rule for a long period and the struggle with western colonial powers allowed for the growth of extremist trends that confuses colonizers with citizens, something which is foreign to Islam culture and thought. Some of these are part of an organized campaign against the Islamists, led by external hostile parties to Islam as well as some secularists who are against anything connected with religion. Today we find ourselves obliged to highlight Islamists' visions and theory in dealing with Arab Christians, in order to correct misconceptions for some people, to reassure the Arab Christians who are part of the fabric of the nation, to establish a relationship based on citizenship.